I made this set of Onesies for a very special friend of mine who is about to have a baby boy. I started with some washed Onesies (it’s important to wash them in order to get the sizing out so the dye will adhere). To make the geometric dye pattern, wrap the Onesies around a paint stir stick (free at most hardware stores) and clip binder clips on the edges. 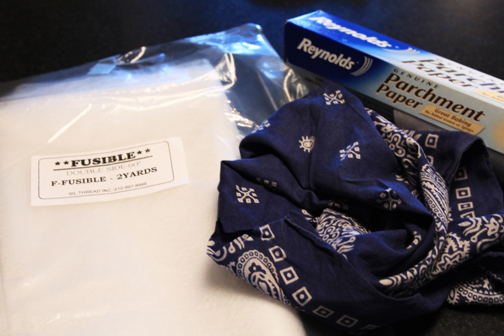 After the Onesies are bound, soak them with water and set them aside. 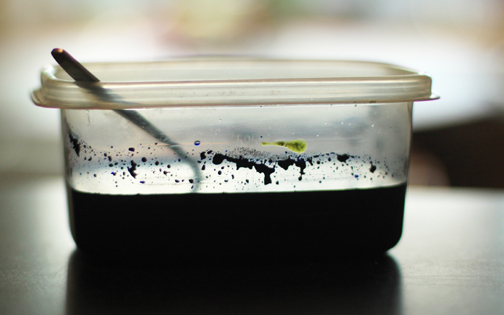 Put some hot water in a separate tupperware and mix the powdered dye until completely dissolved. Mix the soda ash and salt into the bucket of hot water, then add the dye and stir for about 3-4 minutes. Submerge your bound cloth in the water and let sit for at least 1 hour and up to 4 hours. Remove the Onesies from the dye bath, unbind and rinse with cold water. Machine wash and dry. Next I used an old handkerchief to make the teddy bears and heart. I used fusible webbing and parchment paper to iron on the shapes before stitching them to the Onesies. Sandwich the fusible webbing between the fabric and the parchment paper making sure that the piece of webbing is slightly smaller than both the fabric and the paper so it won’t melt onto your iron. Set your iron to high with no steam and iron the three elements together with the fabric on top. Draw and cut out your shapes and pull off the parchment paper, then iron the shape onto the fabric.